I think the fact that this sounds so fucked up may be the reason why I like it so much. I found a version of this album on emusic, but I think I prefer this tape hissed out version. I also like that between tracks you can hear the other side of the tape backwards- I think that kind of transfers in the mp3 version. I think this album, "Bells of Joy" is from 1991. 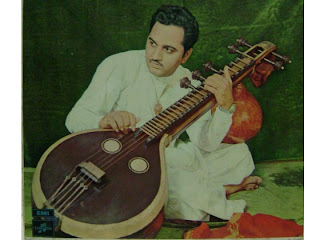 Dr. Chittibabu played the Veena, kind of like a South Indian version of a sitar...I think it sounds more like an acoustic guitar at times. He was a legend in his own lifetime. He passed away on Feb of 1996 of a massive cardiac arrest. He was 59.
time to leave work now.